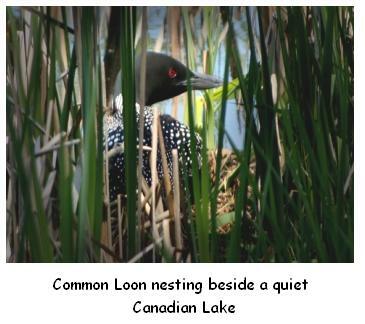 The Loon, sometimes called the Great Northern Diver, is found in Ontario, and is the size of a large duck. These waterbirds, however, are actually members of a different and distinct species of waterfowl and are not related to Ducks, Coots or Cormorants. One of the ways that you can distinguish these birds (les plongeons) from Ducks or Geese, is that they float lower in the water. Their bellies are lower and are underwater when they are on the lake, whereas a duck or goose floats higher. It is not easy to distinguish the males from the females, as their plumage is similar, however, in general male birds are bigger than the females, but it is only noticeable when you see both sexes together. These birds are easy to identify by their black and white plumage, with a grey head and neck, and spear shaped bill. 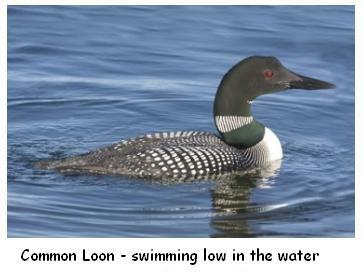 Loons eat mostly fish, but also eat crustaceans and amphibians, including frogs, salamanders, snails and crayfish. They nest and breed on the ground at the edge of freshwater lakes during the summer and prefer nesting sites which are secluded and quiet, such as islands and quiet bays. A variety of materials are used in making their nests - pine needles, grass and leaves, moss and mud, and water plants are all utilized. The eggs take around 4 weeks of incubation for them to hatch and both parents take their turn sitting on the eggs, keeping them warm. Interestingly, experts believe that although both parents take part in nest building and the incubation of eggs, it is the male bird alone who selects the location of the nest. Usually, two eggs are laid and hatched and the chicks are precocial, which means that they are able to swim and follow their parents very quickly after hatching. They are often seen riding on the backs of their parents as they swim on the lake, especially during the first two weeks of life when they are vulnerable to predators, or they do this just to rest - lucky chicks! The chicks are nurtured by their parents for the first six weeks of their lives. After that time they begin to feed themselves and are almost fully independent by three months of age, and are able to fly. 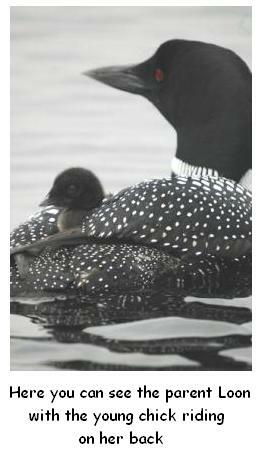 It is thought that the Loon does not mate for life, and may have several mates during its lifetime. These birds can be seen in Southern Ontario as they pass through the area in the Spring, heading to their breeding grounds father north. 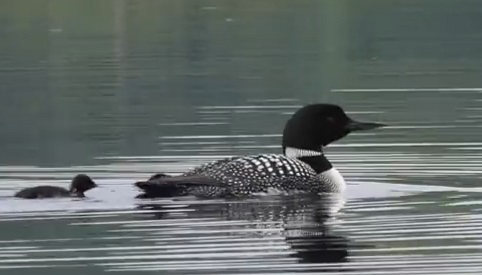 Loons have a variety of calls, some of which are available for you to hear by clicking the links below, courtesy of the Environment Canada website.